Capcom says it wants to get the next Resident Evil game out of the door as soon as possible. Resident Evil 5 did pretty well for Capcom, so well, in fact, that the company's head of global development Keiji Inafune says that it wants to get Resident Evil 6 on the market as quickly as it can. 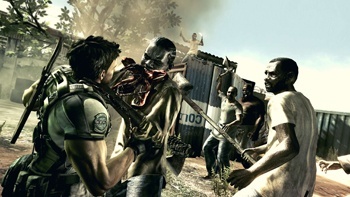 Speaking to Spanish site 3DJuegos, Inafune said that Capcom was eager to capitalize on the momentum generated by RE5's sales, and would have news on a sequel soon. There is speculation that Capcom will announce Resident Evil 6 at the upcoming Tokyo Game Show, which begins later this month. RE5 Producer Jun Takeuchi said last year that he believed that the next Resident Evil would have to reboot the series, but Inafune's comments make it sound like Capcom doesn't want to go messing around with a successful formula. If Resident Evil 6 is indeed imminent, it would be the first high-profile result of Capcom's drive to increase its output of major titles in order to normalize its yearly revenue.